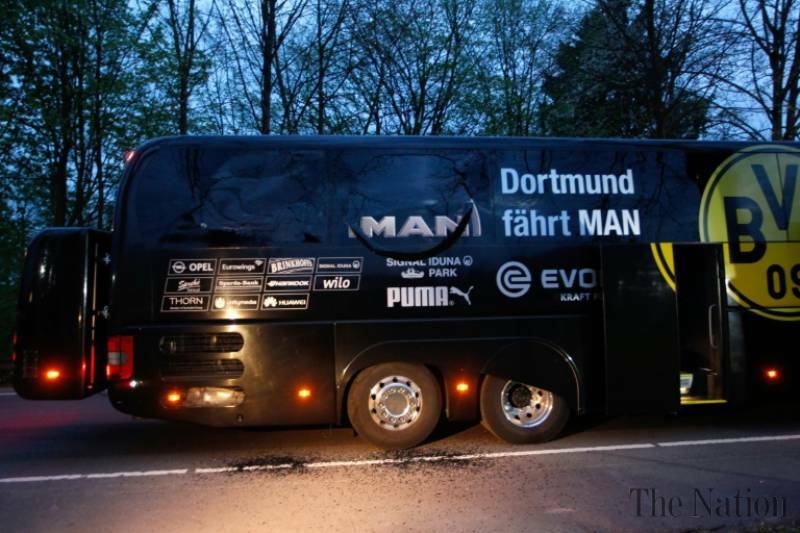 BERLIN: German police on Friday arrested the suspected perpetrator of a bomb attack on Borussia Dortmund’s team bus, the public prosecutor’s office said, indicating his motive was financial and not terror-related. Police commandos working on behalf of the federal prosecutor’s office “have arrested a 28-year-old German-Russian national, Sergej W,” a statement said. It said the suspect was hoping to blame Muslims and profit from a drop in the football team’s share price as a result of the attack. The incident, which occurred on April 11, saw three explosions go off alongside the team bus minutes after it left the squad’s hotel heading for a quarter-final home match against Monaco. The blast shattered the bus windows, and Spanish international Marc Bartra, 26, underwent surgery after he was hit by flying glass. A policeman on a motorcycle escorting the bus suffered trauma from the noise. The explosive devices containing metal pieces appear to have been hidden in a hedge and were set off as the bus passed. The blast had a radius of more than 100 metres. The match was postponed for a day. There were three alleged claims of responsibility for the attack, one of which suggested an Islamist link, but security sources questioned their authenticity, with experts suggesting the aim may have been to put investigators on the wrong track.